In our view, the discounted cash flow (or net asset value) approach is an important method for investors to value oil and gas producers, but variations in methodology and reserve booking practices can result in NAV estimates that are not apples-to-apples comparisons with one another. Most producers are required to have their reserves evaluated annually by a third party. Evaluating reserves entails a significant degree of judgment, and as such, each evaluator will have a slightly different perspective on asset-specific reserves. Evaluators also report net present value estimates for reserves, which are highly dependent on future commodity price assumptions. NAV calculations take into account booked reserves as at the most recent year-end, which include 2P (Proven + Probable) reserves. A common approach is to utilize a “blow-down” scenario (allowing reserves to decline naturally) for the Proved Developed Producing (PDP) reserves, and then layer on future development of the Proved Undeveloped (PUD) and Probable reserves as per the reserve evaluators’ drilling and future development capital (FDC) schedule. Most NAVs are calculated by taking the present value (using an appropriate discount rate) of after-tax cash flows and adjusting for the estimated value of land and balance sheet items such as other assets and hedges, and deducting reported net debt and other balance sheet items (Exhibit 37). Cash flow projections are based on a specific commodity price forecast – most investors will use their own proprietary deck, the futures strip at the time of calculation, or the reserve evaluators’ forecast. 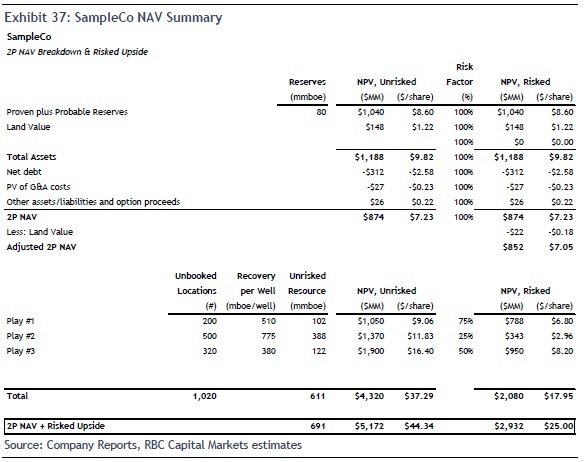 NAV per share (NAVPS) is calculated on a fully diluted basis. As there is a high degree of reserve “booking variability”, investors must often rationalize their view of what is included in the company’s booked reserves and what they consider to be “unbooked exploration/development upside” associated with a particular company’s assets.